Dmytri Kleiner. The Telekommunist Manifesto. Network Notebook Series (Amsterdam: Institute of Network Cultures, 2010). Kleiner starts with a materialist analysis of class relations quite similar to Marx’s. Through their access to the wealth that results from the continuous capture of surplus value, capitalists offer each generation of innovators a chance to become a junior partner in their club by selling the future productive value of what they create in exchange for the present wealth they need to get started. The stolen, dead value of the past captures the unborn value of the future. Whatever portion of our productivity we allow to be taken from us will return in the form of our own oppression. This is possible only because of a monopoly on the function of marketing future value, combined with an artificial floor under the cost of getting started. The productivity of horizontal, networked peer groups is expropriated by the holders of artificial property rights. Those who are able to control the circulation of the product of the labor of others can impose laws and social institutions according to their interests. Those who are not able to retain control of the product of their own labor are not able to resist. Thomas Hodgskin fairly well demolished the “labor fund” doctrine. The financing of subsistence of workers engaged in production can just as accurately be conceived in horizontal terms, as the continual mutual advance of credit by workers to each other against their future production. The capitalist is not someone who advances pay from a labor fund derived from their own “past abstention,” but someone who relies on the preemption and monopoly of this mutual advance of credit function by a privileged class, with the help of the state. The idea of capitalist abstention as the source of the mythical labor fund, and of profit as the reward for abstention or long time-preference on the capitalist’s part, is especially laughable given the fact that the original accumulation of capital — the concentration of enormous investment funds in the hands of a small plutocracy — was actually accomplished through robbery rather than abstention or savings. And it’s rendered even more so by the fact that banks lend money into existence out of thin air, without even the pretense that it’s backed by anyone’s savings. The radical erosion of the latter barrier through ephemeral technology (as described by Douglas Rushkoff) is making an increasing share of venture capital superfluous. For a capitalist class to exist, the market must be rigged…. Capitalism must increase the price of capital by withholding it from labor. 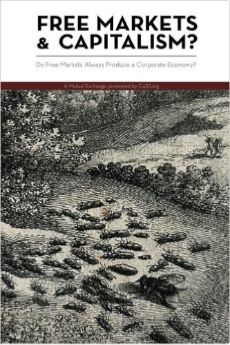 In reality the “free market” is an imposition by property owners on to workers…. Capital needs to make the price of labor low enough to prevent workers, as a class, from being able to retain enough of their own earnings to acquire their own property. If workers could acquire their own property, they could also stop selling their labor to the capitalists. Capitalism, then, could not exist in a free market. This is especially true of the networked, p2p economy. 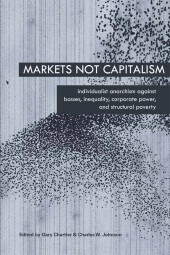 Capitalism depends on the state to impose control within the network economy, particularly to control relations through authorized channels, and thereby capture value that would otherwise be retained by its producers. Points of control are introduced into the natural mesh of social relations…. The state’s ability to grant title and privilege is based on its ability to enforce such advantages through its monopoly on the legitimate use of violence. That is not to say that Kleiner is anti-exchange as such. Like David Graeber, he’s open to the possibility that exchange and markets of some sort would exist as one component of a post-state/capitalist economy. But like Graeber, he’s extremely skeptical that such a post-state, post-capitalist market would bear any resemblance to our present economy, dominated by commodity production and mediation by the cash nexus. If “freed” from the coercion of profit-seeking capitalists, producers would produce for social value, not for profits, as they do in their private and family lives…. This is not to say that a free society would not have competition, or that its members would not seek to benefit from their own labor. Indeed, the division of labor required in a complex society makes exchange and reciprocity necessary. However, the metaphor of “the market” as it is currently used would no longer hold. Kleiner seems to suggest, if I read him correctly, that most discrete acts of production and distribution, on the micro-level, would be governed by the ethos of social production for use, and exchange would take place on a higher level. The “market economy” is, by definition, a surveillance economy, where contributions to production and consumption must be measured in minute detail. It is an economy of accountants and security guards. The accounting of value exchange in tiny and reductive lists of individually priced transactions must be superseded by more fluid and generalized forms of exchange. This suggests that most production for everyday consumption would take place within primary social units with production as a part of daily living, and exchange will consist mainly — as Bakunin envisioned — of the distribution of primary resource inputs over large areas, or the exchange of surpluses between primary social units. Even the accumulated wealth from centuries of exploitation cannot ultimately save the economic elite if they are unable to continue to capture current wealth. The value of the future is far greater than the value of the past…. [I]t is our new ways of working together and sharing across national boundaries that have the potential to threaten the capitalist order and bring about a new society. He also sees such liberatory technologies as the basis of an economic vision of peer-production as a modern, high-tech version of the precapitalist model of production on the commons. Modes of production employing structures similar to peer-to-peer networks have relations reminiscent of the historic pastoral commons, long gone commonly held lands used for the maintenance of livestock and regulated by ancient rights predating modern laws and governments. 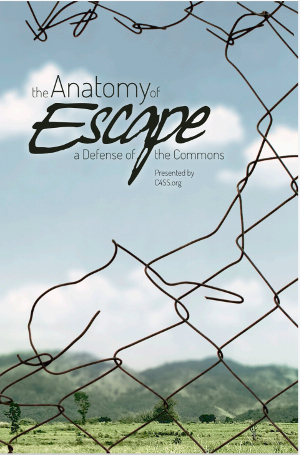 The modern commons, however, is not located in a single space, but rather spans the planet, offering our society hope for a way out from the class stratification of capitalism by undermining its logic of control and extraction…. Peer networks, such as the internet, and all the material and immaterial inputs that keep them running, serve as a common stock that is used independently by many people. Free software, whose production and distribution frequently depends on peer networks, is a common stock available to all…. Mass transportation and international integration have created distributed communities who maintain ongoing interpersonal and often informal economic relationships across national borders. All of these are examples of new productive relationships that transcend current property-based relations and point to a potential way forward. Developments in telecommunications, notably the emergence of peer networks such as the internet, along with international transportation and migration, create broad revolutionary possibilities as dispersed communities become able to interact instantly on a global scale. But Kleiner warns that the peer production and free sharing of informational goods — even including the designs of physical products — will be insufficient to liberate producers from rent extraction if the physical means of production and subsistence remain concentrated in the hands of a small class of rentiers. The increased productivity and cost savings from free and open software and open industrial design will simply be appropriated as rent by the owners of the physical means of production, in the same way that Ricardo’s landlords appropriated the increased productivity from industrial production. a structure for independent producers to share a common stock of productive assets, allowing forms of production formerly associated exclusively with the creation of immaterial value… to be extended to the material sphere. 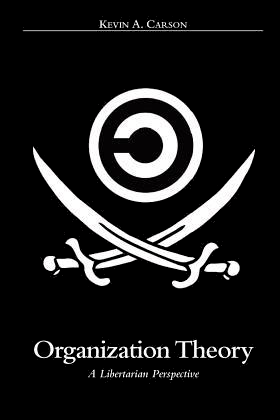 Just as copyleft and other free information licenses turned copyright against itself, the venture commune uses the corporate form as a vehicle for asserting control over productive assets. The commune is legally a firm, but with distinct properties that transform it into an effective vehicle for revolutionary workers’ struggle. The venture commune holds ownership of all productive assets that make up the common stock employed by a diverse and geographically distributed networked of collective and independent peer producers. The venture commune does not coordinate production; a community of peer producers produce according to their own needs and desires. The role of the commune is only to manage the common stock, making property, such as the housing and tools they require, available to the peer producers. The venture commune is the federation of workers’ collectives and individual workers, and is itself owned by each of them, with each member having only one share. In the case that workers are working in a collective or co-operative, ownership is held individually, by the separate people that make up the collective or co-operative…. Property is always held in common by all the members of the commune, with the venture commune equally owned by all its members…. As a platform for supporting self-managed collectives, the venture commune is one example of a larger category of economic models organized on a modular architecture. A venture commune is not bound to one physical location where it can be isolated and confined. Similar in topology to a peer-to-peer network, Telekommunisten intends to be decentralized, with only minimal coordination required amongst its international community of producer-owners. Although there are many networked economic models organized on a module-platform basis, one of the most prominent is the phyle. The phyle was originally created in the fictional setting of Neal Stephenson’s The Diamond Age, and David de Ugarte and his comrades in the Las Indias Cooperative Group adopted the term for the model de Ugarte discusses in his book Phyles: From Nations to Networks (exemplified in practice by the Las Indias phyle and its member enterprises). Draft Chapter Five of my online Desktop Regulatory State manuscript is an extended survey of modular networked economic platforms. The phyle model is especially relevant to Kleiner’s discussion of transnational cultural communities as the base for networked economic organizations. Both Stephenson’s fictional phyles and de Ugarte’s real-life model are based on international linguistic diasporas. Kleiner proposes a finance model similar to the kind of bootstrapping envisioned in Ebenezer Howard’s original Garden City proposals: colonists would pool their resources to buy land at a far enough distance from existing population centers to be mostly vacant and cheap, and then finance municipal services with a tax on the rapidly appreciating value of the land. The function of the venture commune is to acquire material assets that members need for living and working, such as equipment and tools, and allocate them to its members…. The members interested in having this property offer a rental agreement to the commune, giving the terms they wish to have for possession of this property. The commune issues a series of bonds to raise the funds required to acquire the property, when then becomes collateral for the bondholders. The rental agreement is offered as a guarantee that the funds will be available to redeem the bonds. Rents over and above the amount required to service the bonds are issued as a dividend to all members equally — reminiscent of geolibertarian models influenced by Georgism and social credit that finance public services with taxes on economic rent and issue a basic income or citizen’s dividend to everyone. 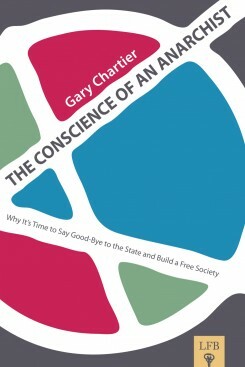 The basic model is a good illustration of the broader anarchist principle summed up by the Wobbly slogan, “forming the structure of the new society within the shell of the old.” It starts out within the interstices of the present system and, leveraging the superior productivity of free people voluntarily cooperating and using their full capabilities without interference from a managerial class that fears their initiative, growing until it supplants the preexisting system.